January 7, 2016 / Steve M.
After a long break from the 1950’s I am now returning to that decade, to list the last of my clandestine titles from “Losfeld and others”. The last few I have been reluctant to list, because they are either, like this one; incomplete, or I just do not like the illustrations. Once I have finished listing this group, they will be going to auction, as part of my reinvestment program, to provide funds for other books. This title is lacking 2 of the promised 10 idées Rose (unless in this edition Mme de V was having a bad day and could only manage 8), it is rebound, with cover preserved. 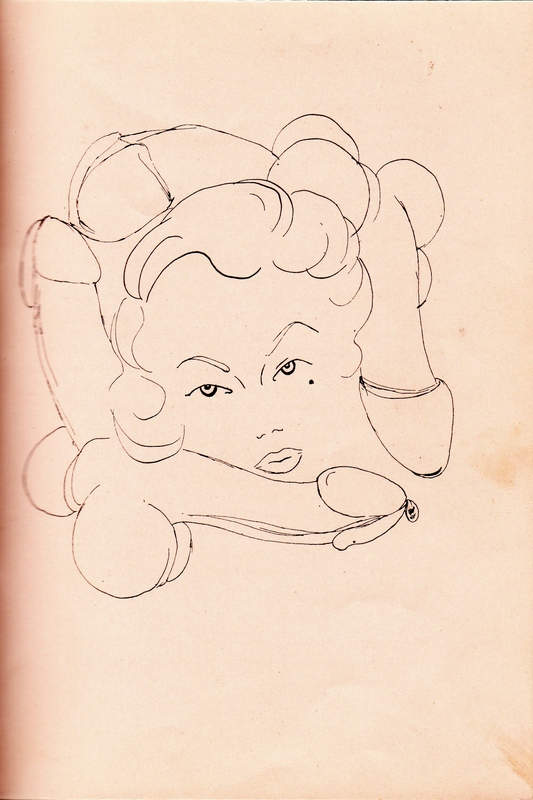 If anyone has copies of the 2 missing illustrations, perhaps they would like to donate copies to complete the listing. This title is available for exchange against my Paris Olympia Press wants. MORIN, Loulou, pseud. 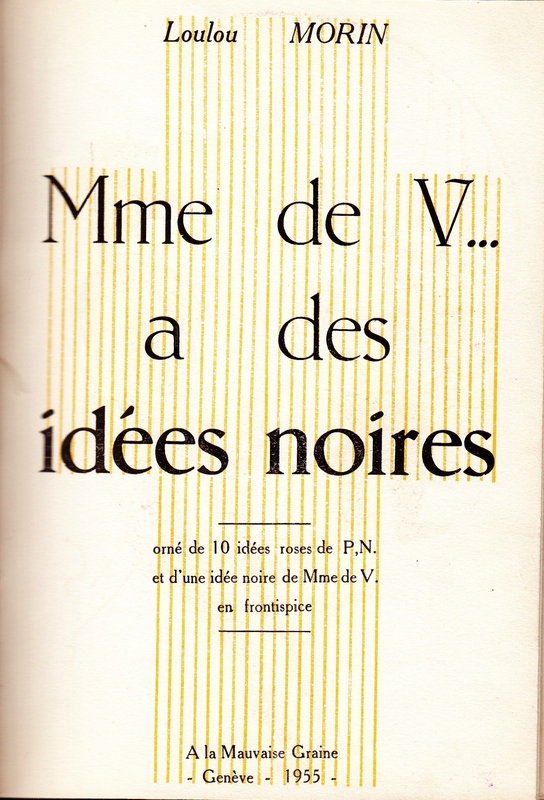 – Mme de V… a des idées noires. 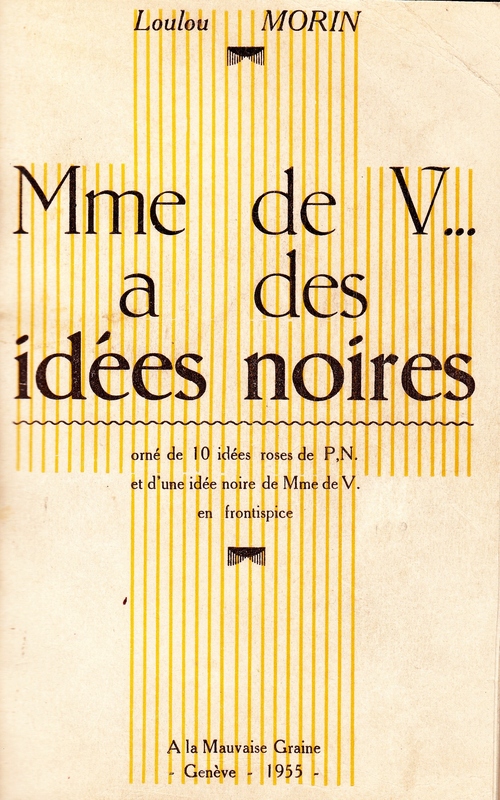 Orné de 10 idées roses ( 8 in this copy) de P. N. et d’une idée noire de Mme d V. en frotispice. Geneve: A La Mouvaise Graine, 1953 . 16mo. Unpaginated but pp. . 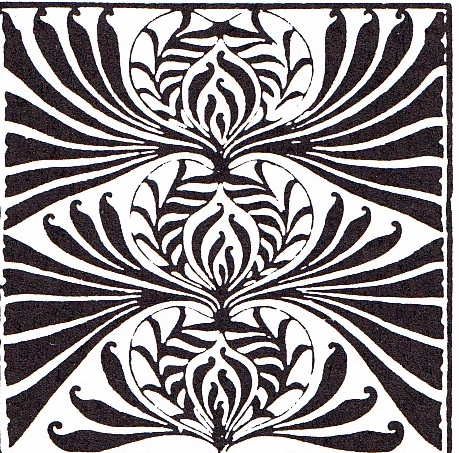 Ten illustrations [by Jean Boullet]. Printed wrappers. Bibliothèque Nationale: Enfer 1661. – Dutel, 2002.] Prosecuted in October 1957. STARCANTE. [ Claude SEIGNOLLE,.] Des Filles et des Hommes,Hong Kong. .